WE ARE RIGHTLY CONCERNED ABOUT TREATMENT IDEOLOGYin this country when, more than ever, so much depends on it. In this issue’s Soapbox (page 30) Paul Hayes argues that as we move towards the new public health system, service users will be at the heart of recovery –meaning client-centred treatment in whatever format they need. 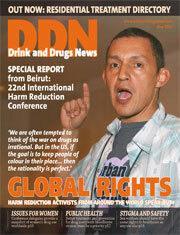 Going to Beirut for the 22nd International Harm Reduction Conference offered a wider perspective on the world, and we have devoted this issue to special coverage of this fascinating and inspiring event. We heard from countries where governments and police routinely crack down on users –and from some where even families prevent their own relatives from receiving treatment. We listened to accounts of women denied healthcare for themselves and their children, and of people driven underground by their countries’ culture of persecution. You might find some of the speakers controversial for many reasons, but the case for basic human rights is undeniable, right down to homeless children on the streets of Russia, sniffing glue to curb hunger. It will give you food for thought –and as Chris Ford says in Post-its (page 25), it makes you think how lucky we are in the UK. At least we have a general acceptance of evidence-based practice.